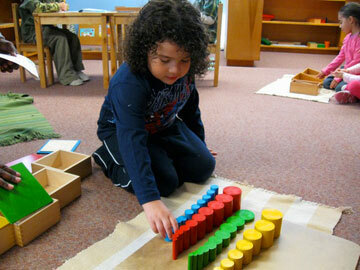 Geography, Biology, Botany, Zoology, Art and Music are presented as extensions of the sensorial and language activities. 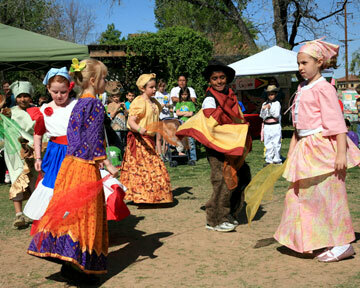 Children learn about people and cultures in other countries with an attitude of respect and admiration. Through familiarity, children come to feel connected to the global human family. Lessons and experiences with nature inspire a reverence for all life. The comprehensive art and music programs give children every opportunity to enjoy a variety of creative activities, as well as gain knowledge of the great masters. 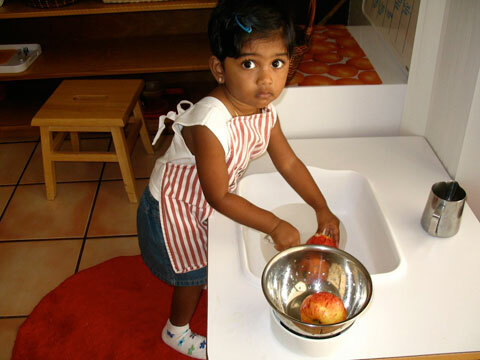 After they begin to walk, at approximately 16 months, children join the Montessori toddler community where basic motor coordination, independence and language development are fostered and individual personality is respected. Rather than a classroom, it is a nurturing social community where very young children experience their first contact with other children and learn to participate in a cooperative group. In an exciting research style of learning, elementary children work in small groups on a variety of projects which spark the imagination and engage the intellect. Lessons given by trained Montessori teachers direct the children toward activities which help them to develop reasoning abilities and life skills. The appetite of children at this age, to understand the universe and their place in it, directs the elementary work toward all aspects of culture. Elementary studies include geography, biology, history, language, mathematics in all its branches, science, music and art. Exploration of each area is encouraged through trips outside the classroom to community resources, such as a library, planetarium, botanical garden, science center, factory or hospital. This inclusive approach to education fosters a feeling of connectedness to all humanity, and encourages their natural desire to make contributions to the world.